Find out about earning Squad Points and calling in Reinforcements. Westie gives you an overview of the different kinds of Reinforcements in Battlefield™ V and how to earn the Squad Points you’ll need to get them. Reinforcements can help your squad in a variety of ways, from re-supplying your buddies when they’re pinned down to wiping out enemies in a single, massive explosion. You earn the ability to call in Reinforcements by racking up Requisition Points. And how do you get those? By working with your squad. Want to know how many your squad has earned? 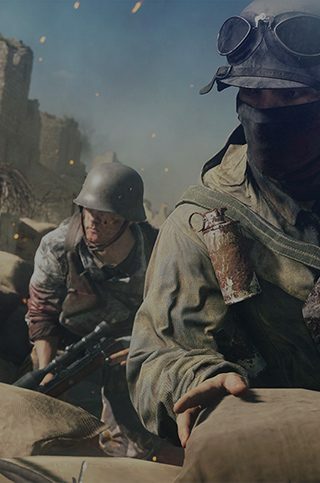 The amount is shown by the Squad Leader’s name near the mini-map. Only the Squad Leader can actually spend Requisition Points, and they do so by bringing up the Reinforcement menu. Grayed-out items can’t currently be purchased. They may cost more Points than you currently have or another squad may have already called in that particular Reinforcement. But remember, once you’ve spent your Points it may be a while before you can earn enough to send that V-1 screaming down on your enemies – so be sure to use them wisely.